The journalist Enzo Biagi (1920-2007) was one of Italy's most famous music journalists. He regularly frequented La Scala in its Golden Years and had ready access to administrators and artistes. He put together a series of films for Italian TV of extracts of productions and interviews with singers, conductors and producers from that period in the 1980s. These are produced in the volumes of this series mastered from the original films. There are some interspersed clips of staging but these are of poor or mediocre technical and visual quality. 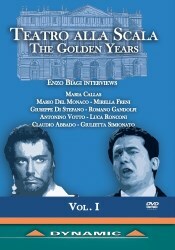 This volume comprises two films, each of which is interspersed with clips from stagings, not always of La Scala origin I suspect as in the case of Callas's act two Tosca, which looks as if it is from the 1964 Covent Garden production. This first volume is introduced by extracts from a rehearsal of Wagner's Lohengrin that opened the 1981-82 season with conductor Claudio Abbado and producer Giorgio Strehler together. This marvellous duo had already set standards that were well beyond what had gone before or, it might be said, that came after albeit there have been notable exceptions. The set is shown being constructed and the costumes and wigs stored as well as music being rehearsed. One of the first interviews is with Mirella Freni, famous for her interpretation of Mimi and in blurred pictures of her in Verdi's Falstaff as well as rehearsing the famous Simon Boccanegra that the above producer-conductor duo put on and which was recorded in 1977 and issued on CD (DG 415 962-2). She is shown seated with Ghiaurov and Cappuccilli at a piano rehearsal followed by a brief shot of the production when Boccanegra is pronounced Doge. I wonder if the film of that memorable production will ever appear on video; if it has I have missed it. Freni talks easily about her successes at La Scala and also about her famous 1964 failure as Violetta in La Traviata. There are extensive interviews with tenors Del Monaco at his villa in Treviso and Di Stefano, the latter very free with his views on fellow tenor Pavarotti and also about Callas's character and as a woman. The former talks about his singing of Verdi's Otello with Rysanek and his own thicker and voice type heavier in character than those of Gigli and Schipa. There is also an interesting clip of a staging at the Piccolo Scala of an early Rossini comic opera La equivoco extravaganza as well as a short, unpublished interview with Maria Callas never seen before. Included in this first volume is part of an interview by the formidable Italian mezzo Giulietta Simionato that is concluded on volume two of this series. Here she talks about the role of Santuzza in Cavalleria Rusticana with a clip of piano stage rehearsal of the dramatic scene as Turridu spurns her entreaties and runs off to his assignation with Lola, very dramatic full-blooded Italianate singing and acting. All the interviewees talk very fast, as Italians do and the titles need a quick eye to keep up. The finales and titles are accompanied by the most incongruous jazz music. All in all this is entertaining viewing for opera enthusiasts whose memories go back to the singers and producers of thirty to fifty years ago.